The monorail is a good way to get from the trunk of the Palm to the Atlantis Hotel. Built by the master developer, Nakheel, it will soon also enable travellers to access the under construction Nakheel Mall. 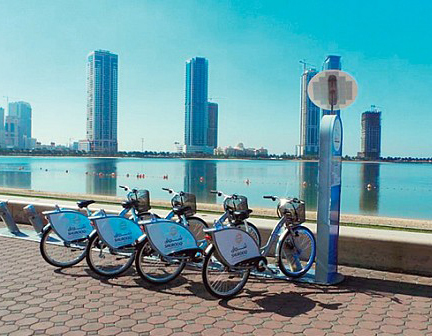 There are several bicycle stops on the Palm where you can pick up and drop off a hire bike. Taxis are inexpensive, clean, new and very reliable. To travel a distance of 25km (at around 30-35 minutes), travelers will only have to pay around AED90 (US$ 25, £16). Taxis are easy to find across all the major tourist locations and can also be booked by phoning Dubai Transport (208 0808). All registered Dubai taxis are metered so you only pay what the meter says. If you want to take to the road yourself, International rental car companies have bases in the airports and in all major hotels. Dubai also operates an extensive above the ground Metro commuter light rail system. The metro system is also safe and reliable and great value for money. To read more about the metro system, please visit the RTA portal. Dubai has a fleet of modern air-conditioned buses. Bus routes are co-ordinated with the metro stations to provide a seamless transportation network. The RTA portal is also the best source for information on the bus system.